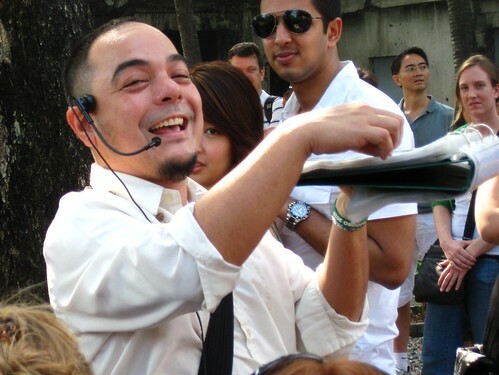 Carlos Celdran is like no other tour guide you've ever experienced! His tours are thought-provoking, entertaining, upbeat, and full of drama. That microphone is no prop. He wears on his belt a tiny speaker that projects his voice to the group and sometimes the right music to put you in the mood. He also has a flip book with pictures for show-and-tell (e.g. pictures of old Manila). He'd occasionally have a Filipino flag, which he waves around so that people know where to follow. And he'd have the appropriate garb and accessories, for the era that he's talking about. In the tour we attended, he beat his own record of having a little more than 100 people on his usually 15-25 people tour. It was pretty overwhelming!